The Rock Ola in Black is the most popular jukebox of all times and has been meticulously reproduced in Rock-Ola's Series V Bubbler! 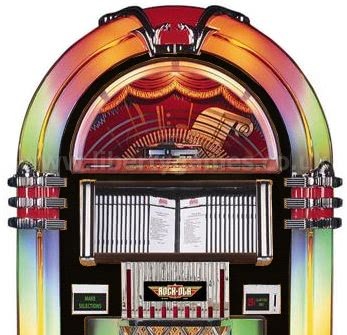 The original Rock-Ola is one of the most popular jukeboxes of all times and it has been meticulously reproduced in this Rock-Ola Series V Bubbler CD jukebox that features 8 bubble tubes and 4 colour translucent plastic cylinders! The Rock-Ola Bubbler Jukebox is one of the most popular jukeboxes of all time and Rock-Ola as a brand has been synonymous with quality as far back as the 1930s. Bubbles of air perk merrily to the top of the 8 bubble tubes and a kaleidoscope of colours flow through the 4 colour translucent plastic cylinders. The quality of the Rock-Ola is unsurpassed with all 19 trim pieces made from genuine die cast metal, triple plated with copper, nickel and polished chrome and only the finest hardwoods are used to adorn this beauty. This Rock-Ola CD Bubbler jukebox is available as standard in a Black Lacquer finish, and it is also available in a classic Walnut wood finish with an African Satin wood door. These are certainly not cheap but went to see the replica jukeboxes around £1000 and they don't even come close so worth saving up. My husband wanted a Wurlitzer but I prefer the look of the Rock Ola models and I won him over in the end. CD loading is easy, but allow a solid weekend to do title cards - Jamie at Liberty managed to email me some software which helps with this task. 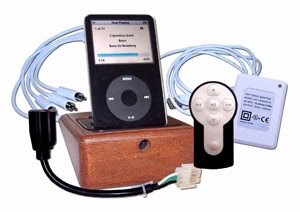 We did not opt for the iPod dock, but I can see the benefit of that.